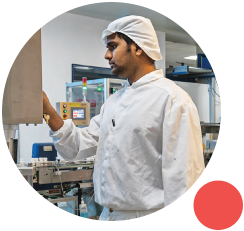 We have development facilities in Hyderabad, India and Cambridge, UK, as well as cGMP API manufacturing facilities in India, Mexico and the UK. Our strong capabilities in synthetic chemistry, analytical chemistry and process engineering, have helped us build a strong portfolio of small molecule APIs across niche areas including peptides, carbohydrates, prostaglandins, steroids, and highly potent APIs. This expertise has enabled us to develop a strong portfolio in key therapy areas including oncology, cardiovascular and central nervous system. Complemented by a fully integrated expertise across key starting materials, intermediates, and APIs, we are able to accelerate the time to market for our customers. As an integrated HPAPI supplier, we have the best in class infrastructure and practices for R&D and cGMP manufacturing. We enable best safety, health and environmental practices through Occupational Exposure Band (OEB) and Occupational Exposure Limit (OEL) based controls for workers, material, machines and environment. We have in-depth scientific knowledge and understanding of the solid, solution and hybrid phases of peptides synthesis. Our expertise includes: downstream purification, isolation, impurity profiling and physicochemical characterization. Linear and branched chain peptides and derivatives with steroids, lipids, PEGs and carbohydrates. We have expertise in complex multi-step carbohydrates involving linear and convergent synthesis. We also have the downstream capability to purify and isolate carbohydrates involving water soluble intermediates. With a dedicated facility for human and veterinary steroids, we have expertise in multi-step reactions, multiple module manufacturing, availability of stainless steel, glass-lined and Hastelloy C® reactors.